Persistence Market Research (PMR) analyzes the automotive shock absorbers market in its new publication titled “Automotive Shock Absorbers Market: Global Industry Analysis 2013 – 2017 and Forecast 2018 – 2026”. This global study on automotive shock absorbers provides data for 2017 along with the forecast for the period 2018 – 2026. The main objective of the global automotive shock absorbers report is to identify the dynamics of the market and provide recent updates and insights that affect the various segments of the global automotive shock absorbers market. To provide a better understanding of the automotive shock absorbers market, the report also includes the analysis of global drivers, restraints and trends, which influence the current market scenario and will define the future status of the global automotive shock absorbers market over the forecast period. PMR’s solution is aligned towards meeting defined objectives, thus helping clients to make informed decisions about the global automotive shock absorbers market. The research study offers detailed insights and in-depth research on the automotive shock absorbers market on global as well as regional levels. The automotive shock absorbers market report covers the important factors driving the growth of the market, untapped opportunities for the manufacturers, trends and developments shaping the dynamics of the market and other insights across various key segments. The automotive shock absorbers market covers diverse sections, such as the Executive summary, Analysis and Forecast, Supply Demand Scenario, Competition Assessment and Research Methodology & Assumptions. We have also analyzed the different segments of the global automotive shock absorbers market in terms of Basis Point Share (BPS) to understand the relative contribution of every individual segment to market growth. This detailed level of information is important for identifying various key trends governing the global automotive shock absorbers market. The report also analyzes the global automotive shock absorbers market on the basis of absolute dollar opportunity. This is usually overlooked while estimating the market forecast; however, from a sales perspective, it is essential to identify the absolute dollar opportunity to identify potential resources in the automotive shock absorbers market. PMR has developed a market attractiveness index to understand the key segments in terms of their performance and growth in the global automotive shock absorbers market. This market attractiveness index is expected to help clients identify real market opportunities in the global automotive shock absorbers market. Automotive shock absorbers are mechanical or hydraulic devices designed to absorb damp shock impulses of vehicles in the global market. Automotive shock absorbers provide not only driving comfort, but also perfect driving behavior and good controllability. In this report, we have considered automotive shock absorbers installed in vehicles and two wheelers only. Industrial automotive shock absorbers have not been considered under the scope of research. Since the last couple of years, hydraulic automotive shock absorbers are being used in most of the vehicle types as they are economical. Hydraulic shocks are only filled with hydraulic oil and the oil acts an excellent damping agent in the whole system. However, the continuous working of hydraulic automotive shock absorbers may create noise or oil leakage problems, which may affect the overall performance of the vehicles and two wheelers. Therefore, gas-filled automotive shock absorbers are a potential replacement option in the market as they are more efficient than hydraulic automotive shock absorbers. In this automotive shock absorbers report, we have crunched separate markets for twin tube automotive shock absorbers and mono-tube automotive shock absorbers. For instance, under the vehicle type segment, the automotive shock absorbers market for twin tube and mono-tube has been separately scrutinized for OEM and aftermarket as well as for the vehicle type segment, such as passenger cars, LCVs, HCVs and two wheelers. 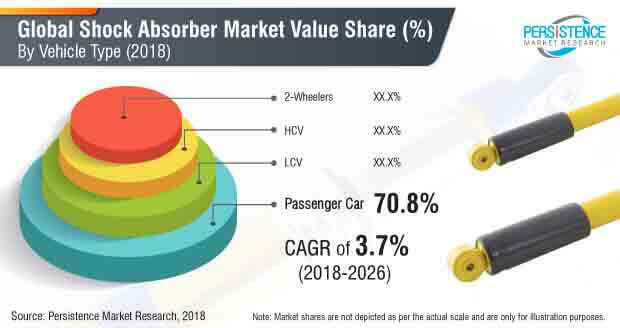 Rising demand for comfort level in vehicles coupled with rising automotive vehicles demand are projected to push the growth of the automotive shock absorbers market over the forecast period. In luxury vehicles, mainly gas filled twin tube automotive shock absorbers are used as they enhance the overall comfort level and driving experience. Furthermore, automotive shock absorbers are also used to enhance the drivability and controllability of vehicles in rough road conditions. In addition, rising automotive vehicle production of passenger cars, LCVs (Light Commercial Vehicles), HCVs (Heavy Commercial Vehicles) and two wheelers, across the globe, owing to rising cargo and passenger density is the other factors expected to drive the automotive shock absorbers market during the forecast period. In the automotive shock absorbers market, manufacturers, such as KYB Corporation, Tenneco Inc., Samvardhana Motherson Group (SMG), thyssenkrupp AG, ZF Friedrichshafen AG, Hitachi Automotive Systems, Ltd., Magneti Marelli S.p.A., ITT Corporation, among others, are some of the prominent players. These manufacturers are keenly focused on joint ventures with small scale players to create a strong customer base across the globe to gain higher market share in the automotive shock absorbers business. Moreover, these players are also opening new automotive shock absorbers manufacturing facilities in developing countries. Furthermore, most of the companies are introducing innovative products to sustain in the automotive shock absorbers market as this strategy helps companies to grow their business in the automotive shock absorbers segment in the global market. By introducing new categories of automotive shock absorbers, businesses can target previously untapped customer markets and gain modest traction in the automotive shock absorbers market. In 2017, Magneti Marelli S.p.A. announced that in 2019 the company will establish an automotive shock absorbers manufacturing plant in Morocco. For this, the company has also signed a deal with the Moroccan State worth US$ 41.8 Mn. The strategic aim of this business deal is to cater to the demand of North African clients. Furthermore, the company has also announced that it will manufacture 6 Mn units annually after the establishment of this plant. Automotive shock absorbers market is a moderately fragmented market owing to the presence of several Tier 2 & 3 players in the automotive shock absorbers market. The leading players have medium to good presence across the globe. Tier-1 players are projected to account for more than 40% share in the global market and are also projected to generate more than US$ 500 Mn value in the automotive shock absorbers market. Some of players hold more than 50% of overseas business in automotive shock absorbers market across the globe. Interestingly, KYB Corporation has ~4.1% net margin and ~5.4% operating margin across the globe. That is also projected to positively impact global automotive shock absorbers market during the forecast period. During this step, we did deep dive research analysis on the applications of automotive shock absorbers. Then, our team defined the automotive shock absorbers in terms of installation location, application and benefits. During the next step, we made a research objectives so that we were contrastable in crunching the automotive shock absorbers market. During the course of the research, our team found out that the aftermarket is also expected to be a most prominent segment for the global automotive shock absorbers market. Hence, the global automotive shock absorbers market has segmented on the basis of sales channel (OEM & Aftermarket) and Design (Twin Tube and Mono Tube). We also conducted primary interviews with automotive shock absorber manufacturers, suppliers and experts who have vast experience in the automotive shock absorbers market. Then interpreted the data collected from various sources and made a perfect frame model for automotive vehicle production and vehicle fleet. In this step, our team selected the useful data with the help of sorting tools, such as Excel, etc. Moreover, the combined data collected from secondary and primary resources was sorted and arranged as per the requirement in the global market. During this step, we also multiplied data with the penetration rate for automotive shock absorbers in regional as well as the global market. During this step, our team regrouped the useful data for automotive shock absorbers. For instance, value share for BPS analysis, final year production of automotive shock absorbers and initial year production of automotive shock absorbers for year-over-year growth were collected. We also used this data to show the incremental $ opportunity charts for the global automotive shock absorbers market. During this step, valuable insights collected by our team during the course of study were collated into a market research report. The automotive shock absorbers market covers diverse sections, such as the Executive summary, Analysis and Forecast, Supply Demand Scenario, Competition Assessment and Research Methodology & Assumptions. Some of the market participants identified across the automotive shock absorbers market include Samvardhana Motherson Group (SMG), Magneti Marelli S.p.A., Tenneco Inc., Meritor, Inc., ZF Friedrichshafen AG, Hitachi Automotive Systems, Ltd., SHOWA CORPORATION, KYB Corporation, ITT Corporation, thyssenkrupp AG, Gabriel India Limited, Duro Shox Pvt Ltd., Arnott Inc., ACDelco, Inc., Zhejiang Sensen Auto Parts Co., Ltd.